Would you like to be informed when new items are made available for sale, as well as stay informed of Alicia's custom order schedule? 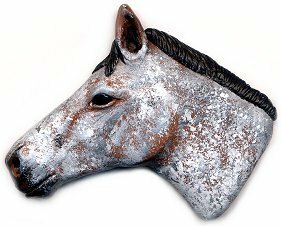 Each horse head is hand sculpted from polymer clay, and is one of a kind! Acrylic paint and artist's chalks are used to achieve various colorations to match your horse. 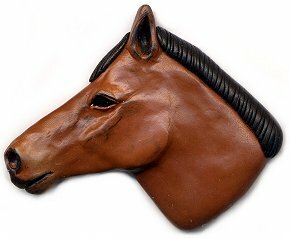 Most horse heads measure about 2 & 1/2 inches wide, and are flat on the back. 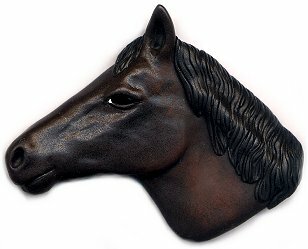 You can have your horse likeness sculpted into an art magnet, pin, pendant or necklace with matching glass beads. You m ust provide at lease one clear photo of your horse's profile for reference. Custom horse portrait hand sculpted from polymer clay, with a neodymium (Rare Earth) magnet on the back. Custom horse portrait hand sculpted from polymer clay, with a pin back for wearing on a blouse, jacket, or sweater. 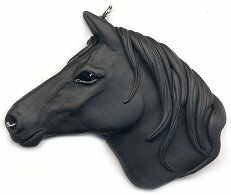 Custom horse portrait hand sculpted from polymer clay, with a bail large enough to fit over most chains, for you to wear with your own necklace chain. 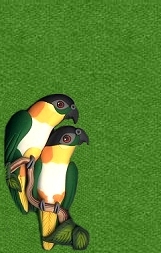 See below for optional leather cord if you would like it strung on cord, and specify your chose length.